According to IIHR’s Dan Ceynar, a dedicated river clean-up volunteer, Project AWARE (A Watershed Awareness River Expedition) is like RAGBRAI on the river – minus the partying. It must have been an amazing sight—dozens and dozens of canoes floating down the Upper Cedar River. Every now and then, one of the volunteers would yell, “Stop! I see a tire!” Then forward progress would halt; they’d splash out into the water and begin the laborious process of excavating the tire and loading it onto the canoe. The Iowa Department of Natural Resources (IDNR) sponsors this week-long canoe-based river clean-up project every summer in July. Project AWARE moves to a different Iowa river each year, bringing hundreds of volunteers eager to pull out the stuff that shouldn’t be there. Group photo of IIHR and IFC students and staff who participated in Project AWARE. This year, IIHR and the Iowa Flood Center (longtime Project AWARE co-sponsors) sent more than a dozen staff and students to Northeast Iowa to join in the clean-up for one day. Many were first-timers; some had never canoed before. Despite blistering heat and humidity earlier in the week, the IIHR crew was blessed with a beautiful Iowa summer day. The water was remarkably clear and fairly shallow most of the time—very inviting for anyone who wanted to cool off with a quick dip. It was also incredibly rewarding, says IIHR’s Ashlee Johannes. “The whole day felt magical, and I am so glad to work at IIHR, which fully supports this for its employees.” She and her canoe partner, Breanna Shea, “punched their ticket” by wrestling a tire out of the water—one of 368 tires Project AWARE volunteers removed from the river over the week. The IDNR organizes and operates the event so smoothly that participants have very little to worry about. “They made the whole experience very fun and stress-free,” says Shea. 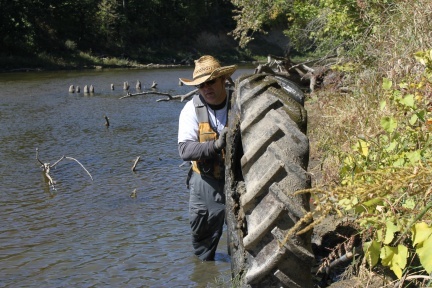 Toward the end of the 12-mile paddling trip, the volunteers came across a decades-old garbage dump that included farm machinery, tractor tires, pots and pans, and more — some of it massive and encased in tons of mud. Canoes clustered around the dump and volunteers jumped out into the water, which was hiding barbed wire and other sharp rusty metal garbage. IGS Geologist Ryan Clark says he and his canoe partner pulled out a pile of metal that was most likely an old corn picker. They really did make a difference, according to statistics gathered by the IDNR: 469 volunteers (ranging in age from 2 to 77) removed 28 tons of trash over the course of the week, including 14.9 tons of scrap metal and 2.5 tons of recyclables.